CAMBRIDGE, UK, April 14, 2012 (ENS) – The first count of a species from space shows there are twice as many emperor penguins in Antarctica than previously thought, an international team of researchers revealed Friday. Scientists from the British Antarctic Survey, University of Minnesota/National Science Foundation, Scripps Institution of Oceanography and the Australian Antarctic Division collaborated on the survey, using high-resolution satellite mapping technology. Lead author and geographer Peter Fretwell at the British Antarctic Survey said the research findings are groundbreaking because they provide a benchmark for monitoring how the penguins are affected by environmental change. The research is published today in the journal “PLoS ONE.” In the article, the scientists describe how they used very high resolution satellite images to estimate the number of penguins at each colony around the Antarctic coastline. 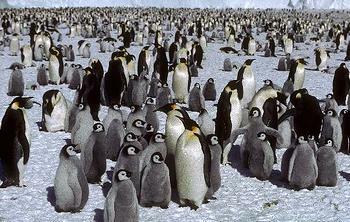 The emperor is the giant of the penguin world and one of the largest of all birds. On the ice, black and white emperor penguins stand out against the snow and their colonies are clearly visible on satellite imagery. 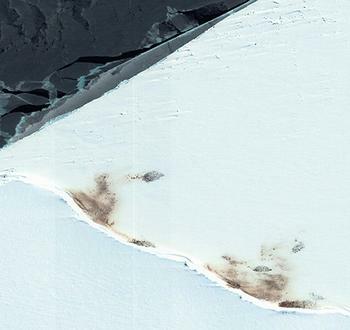 Using a technique known as pan-sharpening to increase the resolution of the satellite imagery, the science teams were able to differentiate between birds, ice, shadow and guano. They then used ground counts and aerial photography to calibrate the analysis. The team to analyzed 44 emperor penguin colonies around the coast of Antarctica, including seven colonies that were previously unknown. Emperors are the only penguin species to breed through the Antarctic winter, with temperatures as low at -50°C and winds of up to 200km (124 miles) per hour. To survive the Antarctic winter, adult emperors have a special combination of adaptations, with a dense double layer of feathers and a large fat reserve. The females each lay a single egg and pass it to the males for incubation. The eggs are balanced on the male penguins’ feet, which are then covered by a thick roll of skin and feathers, which keeps the egg some 70°C warmer than the outside temperature. The females then go to sea to feed, and return around the time when the chicks are due to hatch. The females then take over brooding and feeding the chicks whilst the males, after a nine-week fast during which they may lose 45 percent of their body weight, trek up to 100 km (60 miles) over the ice to find food. When they return, both adults rear the chick.